"'Live in-person' collaborations between Hototogisu and the BxC. Hototogisu, as you know, are the time-defying duo of Matthew Bower (Skullflower, Ramleh, Sunroof!, Total, etc.) and Marcia Bassett (Double Leopards, GHQ, Zaimph, etc.). 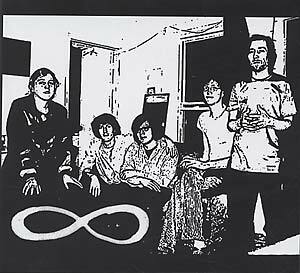 For these sessions, Burning Star Core was C. Spencer Yeh, Robert Beatty, and Trevor Tremaine (the latter two being of Hair Police, Eyes and Arms of Smoke, Sick Hour, etc.). Note that the music on this disc is different material from the Heavy Blossom companion volume HG/BxC II released earlier this year. Five tracks, totalling approximately fifty minutes. Packed into the small Horrible Room (RIP) inside the Cedar House (RIP) down in Lexington KY (still alive), individuals huddled in every corner, painting the room in colored cables, glossy wood and metal boxes. Deafness and disorientation was administered through the afternoon on into the night. Summoning over two hours of recorded tape, it was decided to cut the baby in half for adoption between two imprints. Heavy Blossom ferried away the long thick sides of torso, and Dronedisco seized the hooves, antlers, and jaw. The disc starts off with an appropriate invocation; from there punches blindly through one stone cloud after another, coughs and gasps from exhaustion, stumbles and lies motionless. The ritual concludes with a moment of naked acoustic/instinctual spasm, then a cut-off. Originally released in a very small quantity on CD-R as merchandise during various U.S. and UK spring tours, the Dronedisco half of these sessions has been edited and resequenced for this release in the Autumn." Package comes with button.